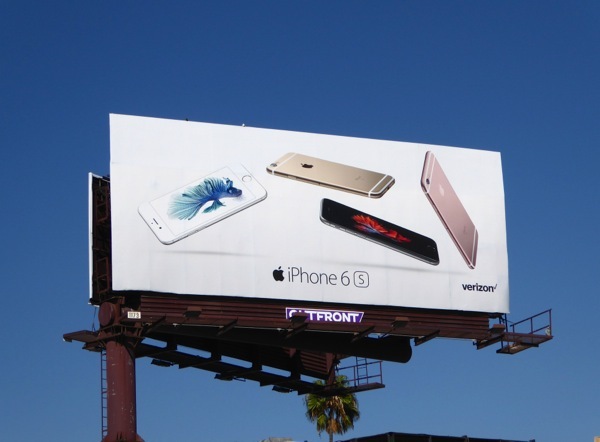 When did Apple's advertising for its smartphones begin to resemble its competitors? 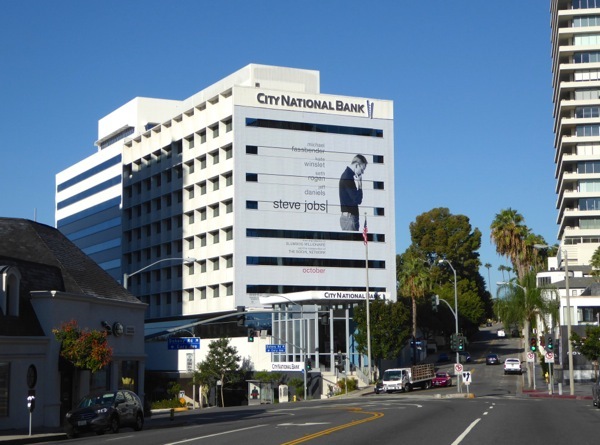 When did the imitated become the imitators? 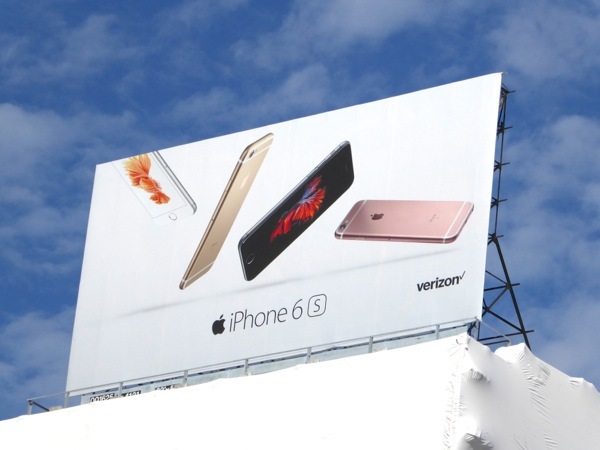 Is it just Daily Billboard, or do these new billboards for the iPhone 6s look and feel like they could be for Samsung's Galaxy smartphone offering? 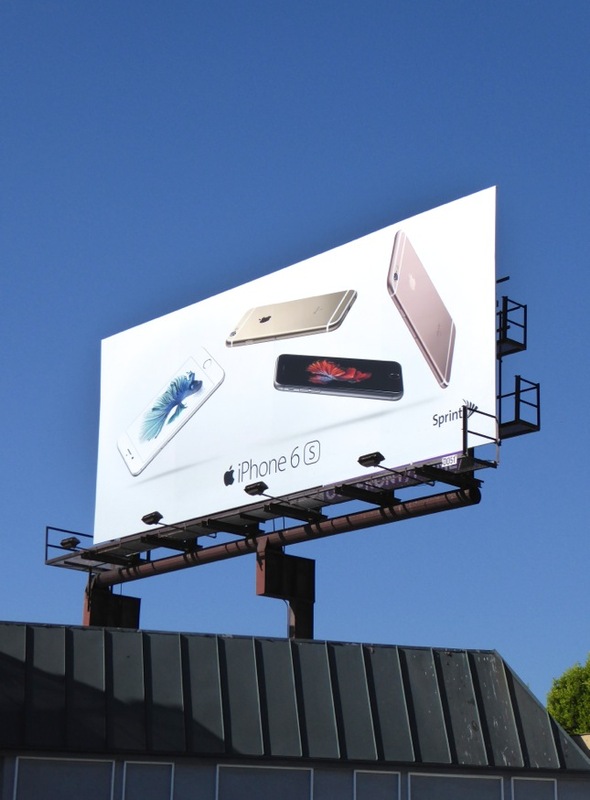 But maybe it's more the look of the product that's evolving than just the ad creatives. 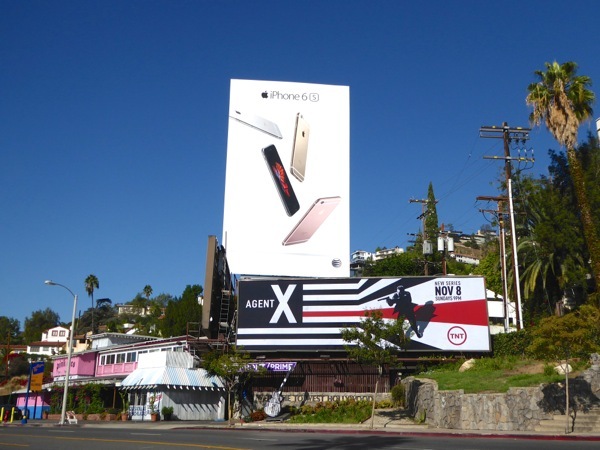 Things have certainly changed since Steve Jobs relinquished control of the company to Tim Cook, with larger sizes of smartphones and a new Apple stylus pen on the horizon to take on the likes of Samsung, and even moving to bring advertising creation in-house. 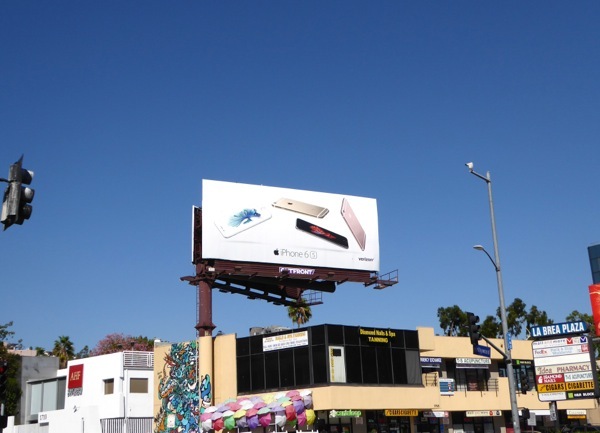 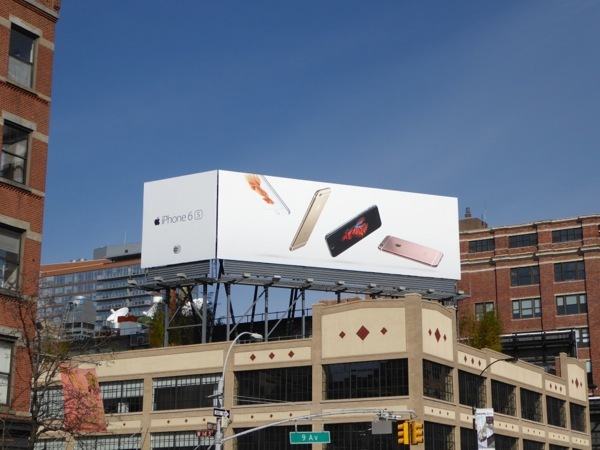 At least this outdoor campaign is the only series of Apple billboards blanketing the city skyline at the moment, compared to recently when three different campaigns from the consumer tech giant unusually seemed to share the skies at the same time - Apple Music billboards, Apple Watch billboards and another wave of Shot on iPhone 6 ads. 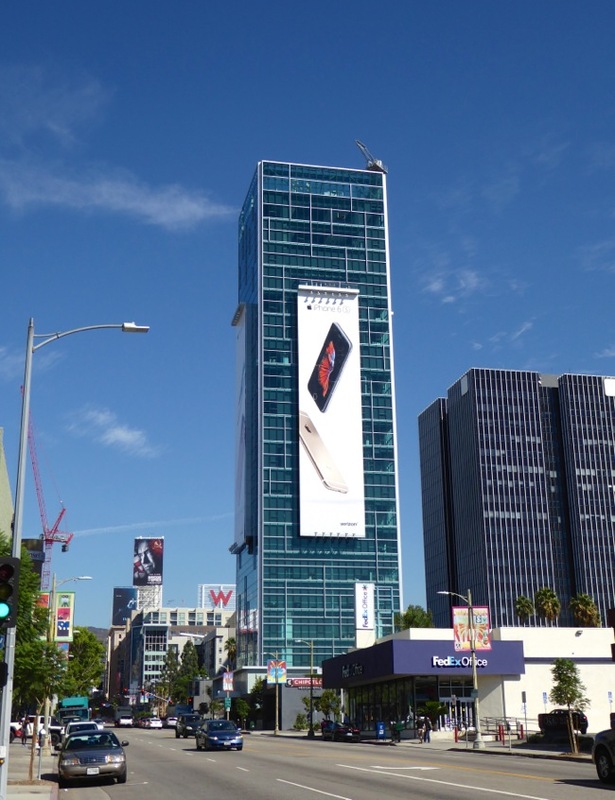 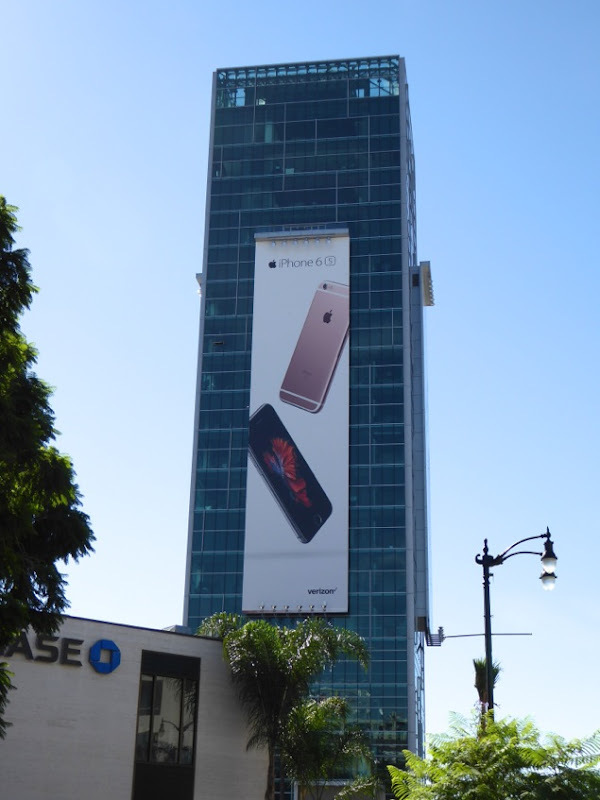 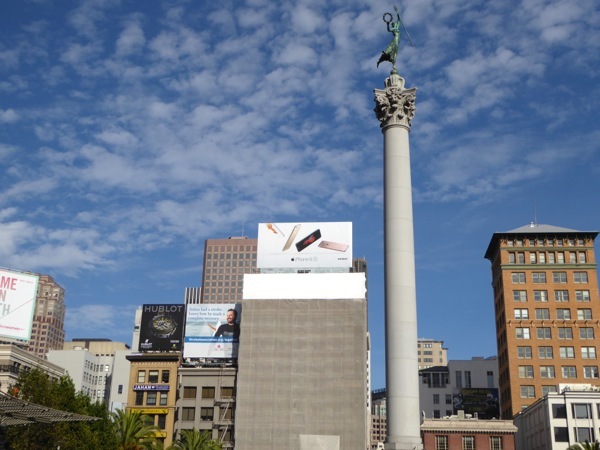 These tumbling iPhone 6s launch billboards were photographed around the streets of L.A. and high above Union Square in San Francisco from October 3 to October 7, 2015. 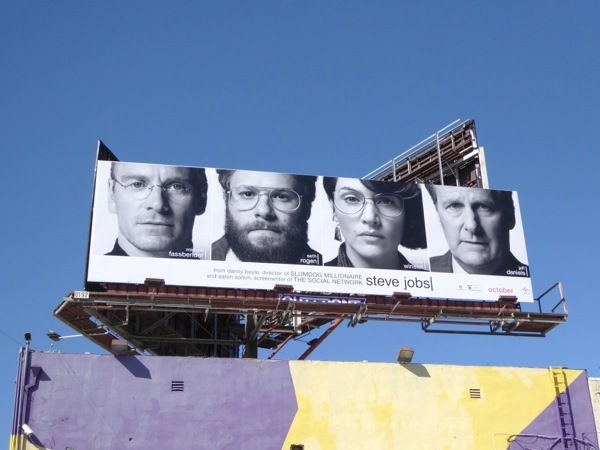 And speaking of Steve Jobs and his legacy, Apple is not the only one spending money this month on outdoor advertising, as the new biopic from director Danny Boyle and screenplay writer Aaron Sorkin is also filling the city skyline in a big way. 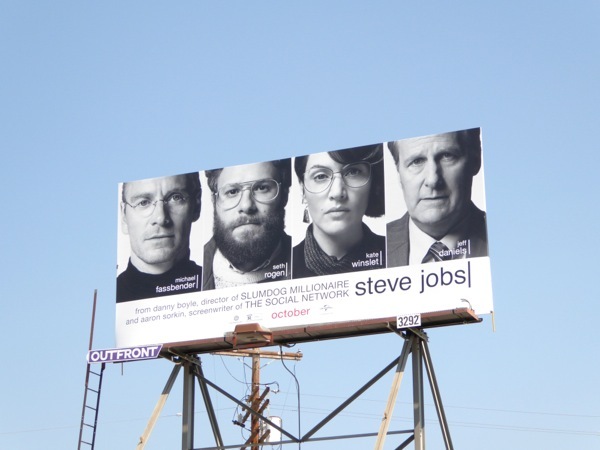 Michael Fassbender stars as the driven co-founder, chairman and CEO of Apple, with Seth Rogen as co-founding computer genius Steve Wozniak and also starring Kate Winslet and Jeff Daniels, as the film goes behind-the-scenes of three key iconic product launches for the company, ending in 1998 with the unveiling of the iMac. 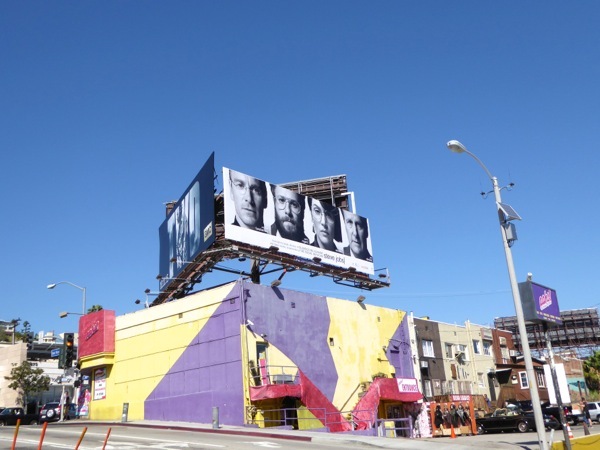 The film has already opened in select cinemas in L.A. and New York, but goes on nationwide release later this month. 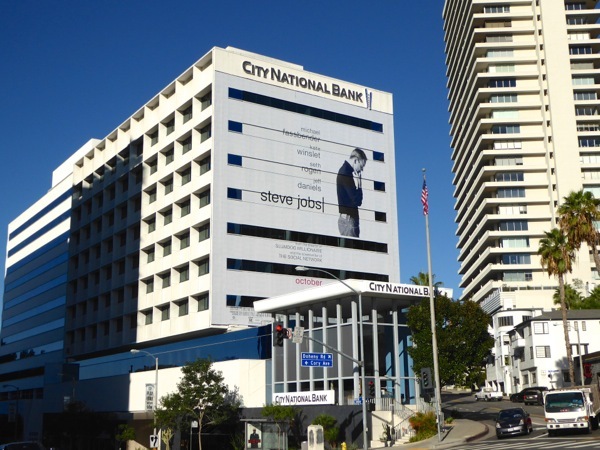 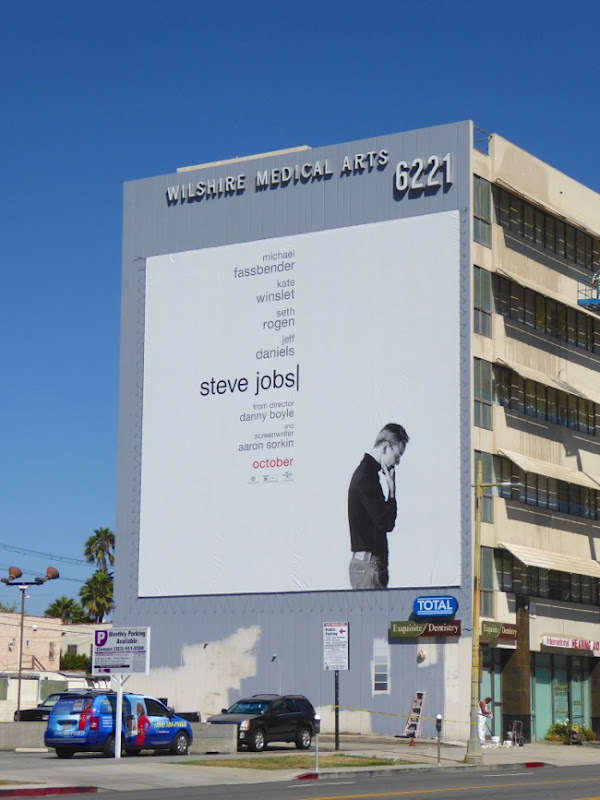 The landscape cast billboard for the Steve Jobs movie was first spied along along Sunset Boulevard at San Vicente Boulevard on September 17, whilst the giant-sized versions were spotted along West Hollywood's Sunset Strip and Wilshire Boulevard on September 19, 2015. 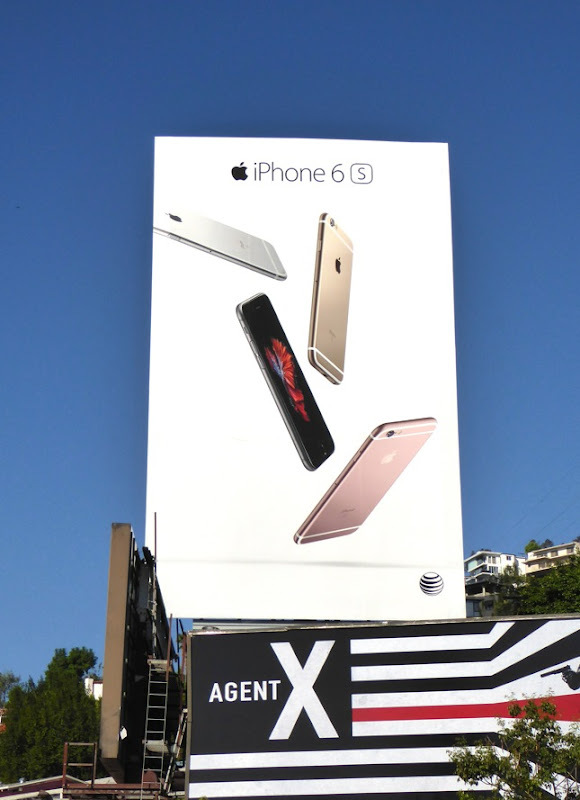 One thing's for sure, a ticket to see the Steve Jobs movie won't set you back as much as the new iPhone 6s will. 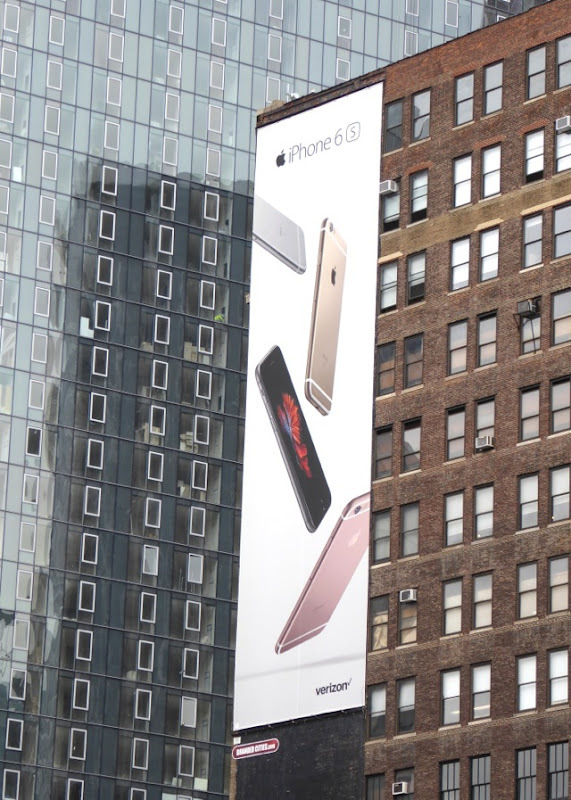 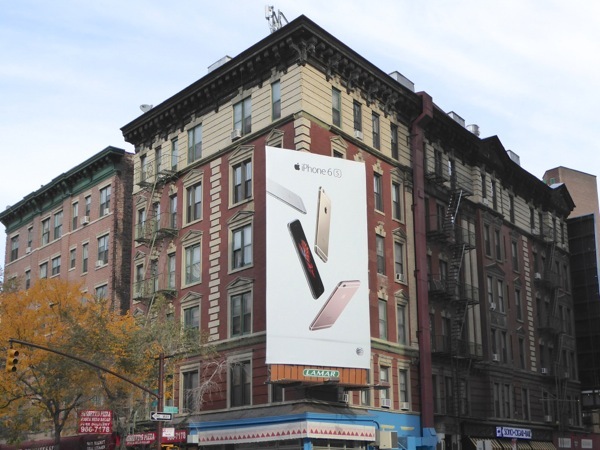 UPDATED: Here's also a collection of billboards for the new iPhone 6s photographed around the streets of New York City from October 31 to November 2, 2015. 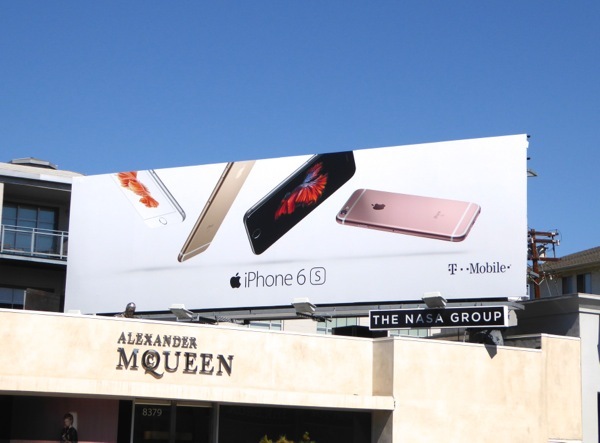 It's staggering to think how much money Apple spends on outdoor advertising to have this level of visibility in major cities around the world.